When it comes to losing weight, we understand that deprivation just doesn’t work. We’re also familiar with a couple of the standard no-no’s in the weight loss community: avoid sugar and limit salt intake. While both of those are perfectly fine in moderation, if you want to cut them out of your diet, you might find yourself faced with a variety of pretty bland menu options. Change is already hard enough… why make it more difficult by making the ‘new’ not as appealing? At Positive Changes, we love the mantra, “Don’t cut out... crowd out.” In other words, fill your diet with healthy, yummy foods… so much so that there’s no room for processed foods or sugary additives. One way to do this is to opt for using natural herbs and spices to season your meals. After a while, it will become second nature to reach for your spice rack instead of the sugar bowl, salt shaker, or oil dispenser. If you’re anything like most people, this dive into the spice-world sounds scary and unsettling. You know exactly how to use salt, sugar and oil to cook with. However, when it comes to the spice rack, you might know how to pronounce the names, at best. But using them? Correctly? You’ve got to be joking. But we’re not. Using herbs and spices in cooking is easier than it might seem. If you’re armed with a good recipe, it will clearly state which ones – and how much of each - to use. Plus, grocery stores usually arrange their spice rack in alphabetical order to make finding the more obscure names more easily. 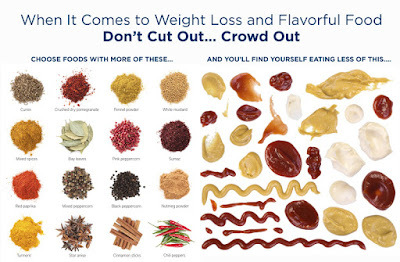 If you’re of the ‘I don’t like sticking to recipes’ variety (you know who you are), below is a little cheat sheet on some of the more common seasonings found in your kitchen cabinet, and what foods pair best with. Bon Appétit! Use sparingly. Its hot and spicy flavor is great in vinegar-based sauces, can be combined with lemons in marinades, and works well with all types of meat. It's best in salsa, guacamole, and combined with lemon and lime for marinades. The leaves are often mistaken for flat-leaf parsley, so read the tag. One of the most versatile herbs, cilantro adds distinctive flavor to salsas, soups, stews, curries, salads, vegetables, fish, and chicken dishes. These seeds are great added to soups, fish, and smoked meats, like turkey. It also blends well with cumin. In the kitchen, its feathery leaves lend a fresh, sharp flavor to all kinds of foods: cottage cheese, cream cheese, goat cheese, omelets, seafood (especially salmon), cold yogurt soups, potato salads, and all kinds of cucumber dishes (including, of course, pickles). Its needlelike leaves have pronounced lemon-pine flavor that pairs well with roasted lamb, garlic, and olive oil. Rosemary is also a nice addition to focaccia, tomato sauce, pizza, and pork, but because its flavor is strong, use a light hand. With a slightly peppery flavor, sage is great with sweet fruits and veggies, like apples and squash, but it also adds a punch to sausage and a variety of cheeses. And don't worry about overcooking—this powerful spice's flavor holds up well when cooked for long periods of time. This congenial herb pairs well with many other herbs—especially rosemary, parsley, sage, savory, and oregano. Its earthiness is welcome with pork, lamb, duck, or goose, and it's much beloved in Cajun and Creole cooking. It's also the primary component of Caribbean jerk seasonings.